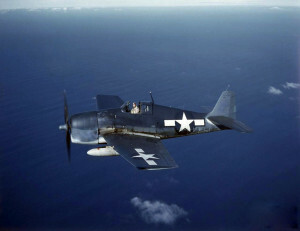 On March 31, 1945, Ensign Setomer took off from the Westerly Auxiliary Naval Air Station in Westerly, Rhode Island, for a training flight in an F6F-5 Hellcat, (Bu. No. 70345). After two hours of flight time he noticed a drop in oil pressure and made a deferred emergency landing at Quonset Point Naval Air Station in North Kingstown, Rhode Island. There his plane was inspected and serviced, with four gallons of oil added. Ensign Setomer then took off headed for Westerly, but after one minute of flight time the engine began to sputter and then froze. Ensign Setomer made an emergency water landing in Narragansett Bay about one mile south of Quonset Point. He successfully inflated his life raft before the plane sank, and was rescued a few minutes later by a crash boat. Source: National Archives AAR 338; TD450331RI, via Larry Webster, Aviation Historian, Charlestown, R.I.